Chaim Sanders of Trustwave shared a link to a blogpost with XSS extracted from Reddit’s XSS subreddit. I sat in the train the other day and thought I could kill time by taking a look at the traffic and how ModSecurity and the Core Rules would handle it. echo -n "N=1 : "
echo -n "N=2 : "
echo -n "N=3 : "
With that, I was ready to launch the payloads against my three setups. All went smooth. So the upcoming Paranoia Mode in the development version of the Core Rules does what it is meant to do: It is more paranoid and brings more alerts. With CRS 2.2.9, 22 requests (of 572) passed without any alerts. With CRS 3.0.0 on Paranoia Level 1 (default), this number was 65, on PL 2 again 22 requests (which is by hazard the same number as with 2.2.9). So while it is good to see, that around 95% of the attacks were detected, it is not so cool that 5% went undetected. Which payload was undetected in 3.0.0 PL2? Looking through this list, it looks that these attacks are not overly aggressive. To say the least. The author of the said list might have looked it through before publishing. There is one exception though, payload on line 343, which is in fact an XSS and I think it should be detected. If we look at 2.2.9, there is a single difference: The payload #343 was detected (but #446 was not). Which rules did detect #343 in 2.2.9? 973335 IE XSS Filters - Attack Detected. Apparently, these Anti-XSS rules were all evicted from 3.0.0 likely because of too many false positives. Maybe they had some merits after all. 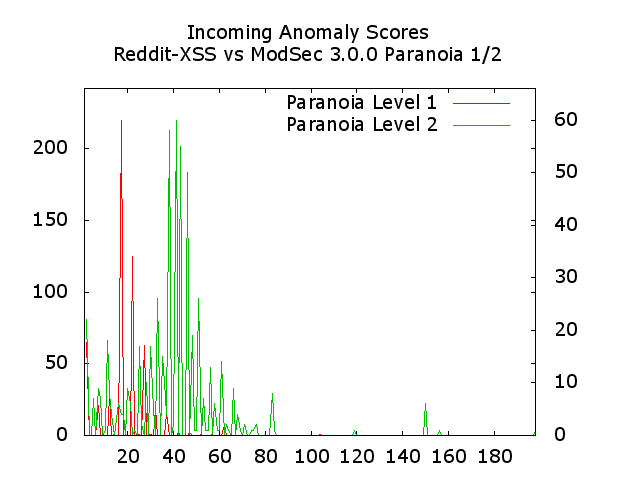 I did not look into the rules which passed ModSec 3.0.0 with paranoia level 1, but the idea of that setting is to have less false positives and accept some false negatives instead. So it is likely some XSS payloads went unnoticed. 3 973317 IE XSS Filters - Attack Detected. 3 973324 IE XSS Filters - Attack Detected. 6 973316 IE XSS Filters - Attack Detected. 6 973327 IE XSS Filters - Attack Detected. 11 973346 IE XSS Filters - Attack Detected. 13 973332 IE XSS Filters - Attack Detected. 19 973330 IE XSS Filters - Attack Detected. 19 973333 IE XSS Filters - Attack Detected. 26 981231 SQL Comment Sequence Detected. 82 973334 IE XSS Filters - Attack Detected. 351 973335 IE XSS Filters - Attack Detected. 353 973331 IE XSS Filters - Attack Detected. 370 950901 SQL Injection Attack: SQL Tautology Detected. 3 941230 IE XSS Filters - Attack Detected. 3 941300 IE XSS Filters - Attack Detected. 11 941210 IE XSS Filters - Attack Detected. 13 941330 IE XSS Filters - Attack Detected. 19 941340 IE XSS Filters - Attack Detected. 26 942440 SQL Comment Sequence Detected. 371 942130 SQL Injection Attack: SQL Tautology Detected. It’s nice to see that libinject is doing a good job here for the 3.0.0 rules (it’s not active in CRS 2.2.9; here it is active in rule 941100). As usual, the workhorse of anomaly detection 942430 (in 2.2.9, this rule was 981173) is adding many, many alerts for Paranoia Level 2. Unfortunately, this is also the case with legitimate traffic. There are still discussions on what to do with this rule, but the most likely outcome is, that we are going to raise the limits a bit (and add a stricter sibling at higher Paranoia Level 3 and on and PL 4). So what do all these stats tell us? ModSecurity does a decent job with detecting XSS. There is a small hole with 3.0.0, that we should look into. But otherwise, things look neat. If you think, this is interesting research and if you would like to discuss the results, then please join the OWASP ModSecurity Core Rules Mailinglist, where we try to improve the ruleset in an open process.